Mirror Game works like this: Maggie’s in love with Bob, Bob’s in love with Sarah, Sarah’s in love with Luke, Luke beats on Sarah. Through it all, we see their parents as giant shadows that loom over their lives. So I decided to write the play about that. 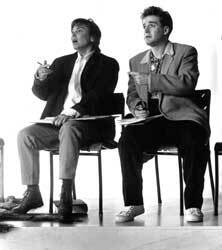 But by far the best play for young audiences published in 1992 is Mirror Game. Dennis Foon has long been impressive as a playwright, as co-founder and artistic director of Green Thumb Theatre in Vancouver, and as creator of “Feeling Yes, Feeling No,” the influential social intervention work on sexual abuse. As in all of his work, Foon impresses here by his refusal to condescend to audiences that may be young, but are not stupid. He writes with intelligence, wit, irreverence, and complexity. Like most of his work, Mirror Game is fun, but not frivolous; it is up to date without making embarrassing efforts to be trendy; and it deals with an astounding number of serious issues – from verbal, physical, and sexual harassment to parental neglect and alcoholism – but does so naturally, entertainingly, and without oppressive earnestness. Mirror Game is an extraordinary play. First produced by Green Thumb Theatre.